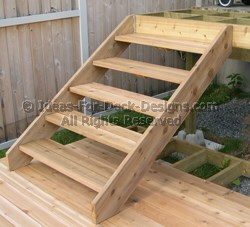 The final stage in building your deck is likely going to be when you connect the stairs to the deck. 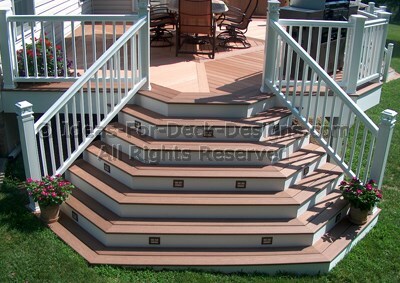 Every set of stairs has to be connected to the deck somehow. It is not always done the same way. Here are the various ways in which you can attach them and it is dependent on joist direction or the style of the stairs. The framing methods may vary slightly but the essence of the concept remains the same. Extend boards down from the back side of the rim joist. Install blocking between internal stringers and use option metal strapping if you are wish. This side profile view provides another way to see what is going on. 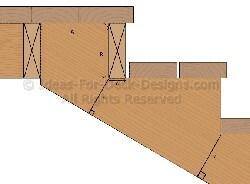 To attach notched stringers to a deck requires attaching some kind of backer board to the rim joist, increasing the width of the rim joist so the stringer has more material to contact. 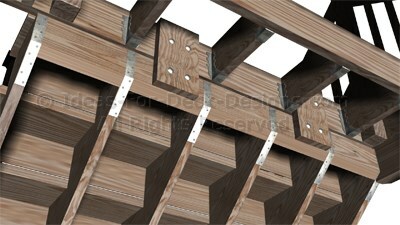 If the joist are 2x10 or 2x12 you may be able to secure the stairs against the lower portion of the rim joist. Just be aware that if there is too little space for the stair horizontal blocking to be safely connected to the rim joist this option has to be re-thought. 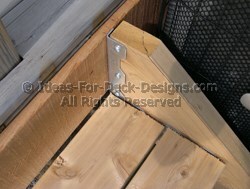 Additional blocking would be required if metal strapping is used which would significantly increase the strength of such a connection. If joists are running perpendicular to the stair location and you are using, at a minimum, a 2x12 stringer, you may wish to employ this method. The math changes a little for the unit run of the first tread as this diagram shows. Connecting solid stringers where there are no support stringers in the middle of the tread allows you to use metal angle brackets as you can see here. Remember: The maximum distance treads should span is 36" if they are thick enough. Otherwise, you must add a cut stringer at midspan to provide enough support. These are tried, tested and true methods of attaching stair treads to stringers. You now have a few styles to choose from depending on the look you prefer.